¨The difference between today and last Saturday is that for the first time in a while, I can look forward to the things I want to do in my life. Bike, eat, drink, talk, ride the subway, read, run, travel, swim, skip.¨ They say that two heads think better than one, and that might be the case with directors Anna Boden and Ryan Fleck who have collaborated in the past with films such as Half Nelson (which gave Ryan Gosling his first Oscar nomination), and the surprise critical hit of 2009: Sugar, about a Dominican baseball player trying to make it in the major leagues and adapting to his new life in the United States. The Cohen brothers also prove this point so there is nothing wrong with teaming up as directors. Boden and Fleck have demonstrated their directorial talents before and do it once again with It's Kind of a Funny Story. The three films they have directed are all very different from each other, and this is more or less a dramatic comedy with probably more drama to it than comedy. This isn't one of those laugh out loud Galifianakis comedies, it is much more serious, but there are still plenty of laughs (or at least scenes that will make you smile). This movie has some heart to it as well; there is good chemistry between the two young characters played by Gilchrist and Roberts. The romantic story works, the drama works, and so does the comedy as long as you aren't expecting a film like The Hangover. 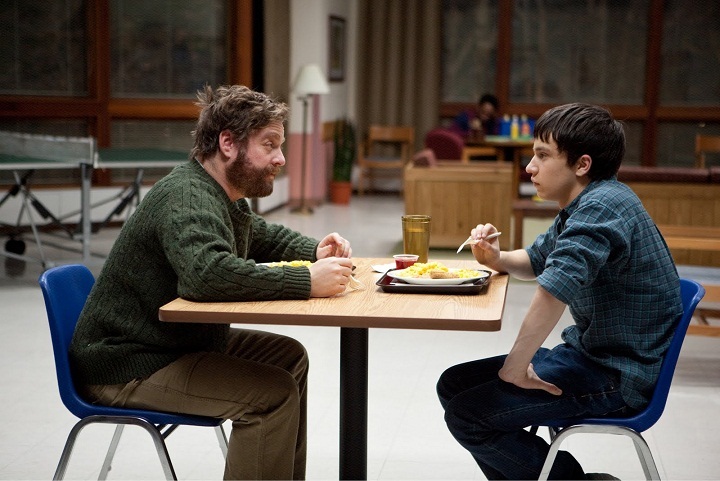 Boden and Fleck adapted the screenplay themselves from the novel of the same name written by Ned Vizzini. This is not your typical Hollywood film, it is different and you probably would expect that if you've seen the rest of the films they have directed. Craig (Keir Gilchrist from the United States of Tara series) is a smart kid, who studies at a gifted school, and has a normal loving family, but who deals with depression and suicidal thoughts. He is obsessed with his best friend Aaron's (Thomas Mann) girlfriend Nia (Zoe Kravitz). Craig decides to check himself into a mental institution on Sunday expecting to spend the day there, but doctors decide he should stay a week and follow the program since he claims to be a danger to himself. His parents Lynn (Lauren Graham from Gilmore Girls) and George (Jim Gaffigan) are supportive of the doctor's decision and decide to let him stay at the mental hospital in the adult ward since the juvenile section is under renovation. Craig is really stressed out with his life and about getting the Gates Application for Summer school which would look great for his college resume. His father is always focused on his job, but is pushing Craig so that he can get the application. Craig seems to be obsessed and stressed out with all these little things, and forgotten therefore to enjoy life. In the ward he meets patients with much greater problems than his own. He befriends Bobby (Zach Galifianakis) who teaches him a couple things about life, but who seems to have a lot of issues of his own. Then there is his Egyptian roommate who never speaks to anyone or leaves the room, Muqtada (Bernard White). And finally he meets Noelle (Emma Roberts) a girl about his age who he begins falling for. Together the patients learn from each other and Craig begins to find help in his therapy sessions with Dr. Eden Minerva (Viola Davis), as well as with drawing and music sessions. It's Kind of a Funny Story might not be as funny as you expect, but it is kind of a sweet story. The film doesn't try to be preachy or anything like that at all, but it is kind of uplifting and one can find a way out of depression by watching this movie. Finding the things one enjoys in life and focusing on them instead of all the other issues can help live a less stressful life. The characters in the ward are much more interesting than the rest of the characters from the outside world. Craig's parents, his friend Aaron and his girlfriend all are left in the background since they are outshined by the patients who are way better developed in the film. Galifianakis shines in every scene he is in, Gilchrist and Roberts are really good together on screen and share some great chemistry, and the rest of the patients all share the most memorable moments of the movie. We are drawn into the world of the mental hospital and could care less about the outside world. One of the best scenes of the movie is when the patients get together for their musical therapy and they all play the song Under Pressure. It's Kind of a Funny Story reminds us that there is more to life than just study and work, it's the little things which can give us the most pleasure out of life. We can't change anything through worrying so why stress out so much. I really enjoyed this movie and recommend it although be warned it's not your typical Hollywood film. It is kind of slowly paced, but once you meet the characters inside the ward it's worth it.